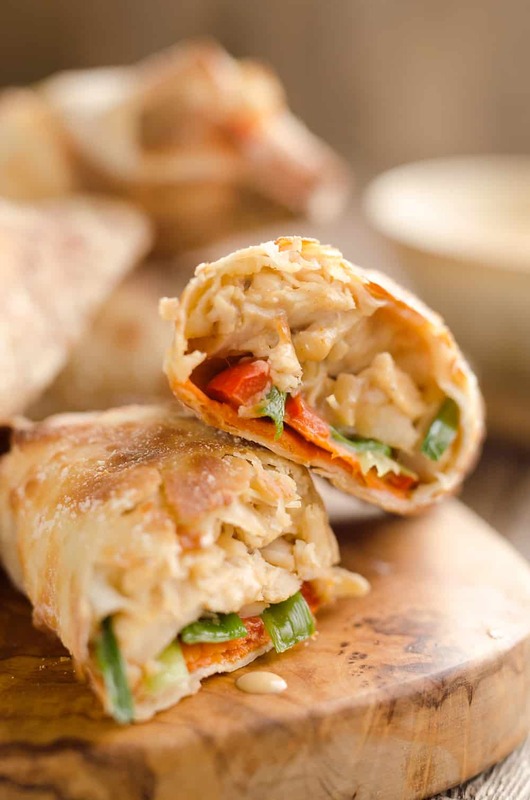 Airfryer Baked Thai Peanut Chicken Egg Rolls are a light and healthy recipe made in your Airfryer or oven. 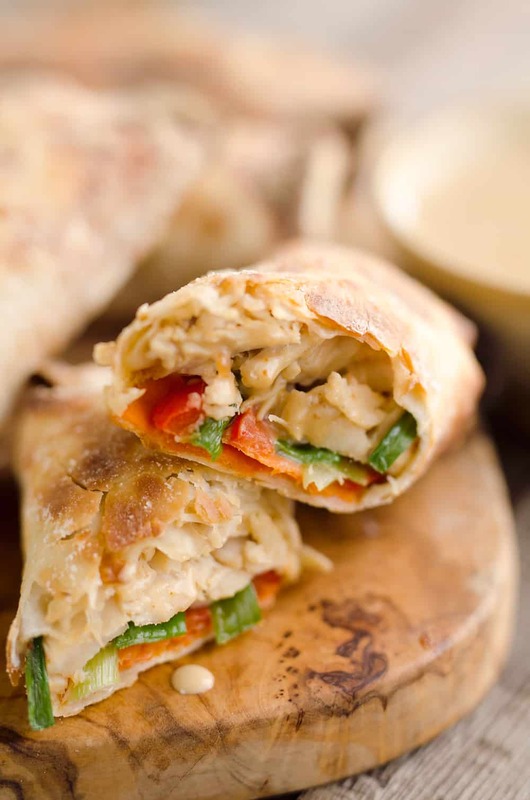 Chicken is tossed with creamy Thai peanut sauce, carrots, red peppers and green onions and rolled in crispy egg roll wrappers for a flavorful dinner you can make in less than 20 minutes. This Thai Peanut Sauce made with light coconut milk, peanut butter, lime juice and an assortment of spices is one of the best things you will make in your blender. 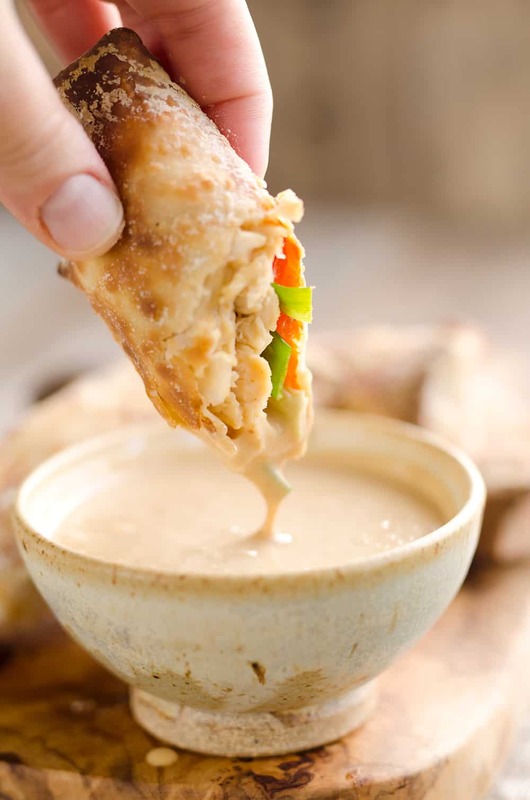 Forget the tired store-bought sauce and take the extra 5 minutes to make this amazingly delicious homemade Thai Peanut Sauce for the real star of these Airfryer Baked Thai Peanut Chicken Egg Rolls recipe. Just throw everything for the sauce in your blender and pulse it for a minute. The resulting sauce is creamy with amazing layers of flavor. I have used this sauce for countless recipes and all the reviews agree, that this sauce is a real winner! The other vital component of this dish is the Airfryer! I adore my Phillips Airfryer for baking up just about anything in a fraction of the time your oven takes. I love my Airfryer so much that I bought a second one for my office! 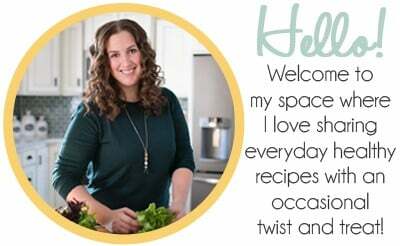 From cooking up homemade crispy chicken tenders and frozen fish fillets, to making a batch of Airfryer Parmesan Dill Fried Pickle Chips, it is the best small appliance you can buy for your kitchen! When I am feeling particularly lazy, I will throw a simple meal of steak and sweet potato fries or some pre-made frozen chicken strips in and I have food on the table in just 10 minutes! 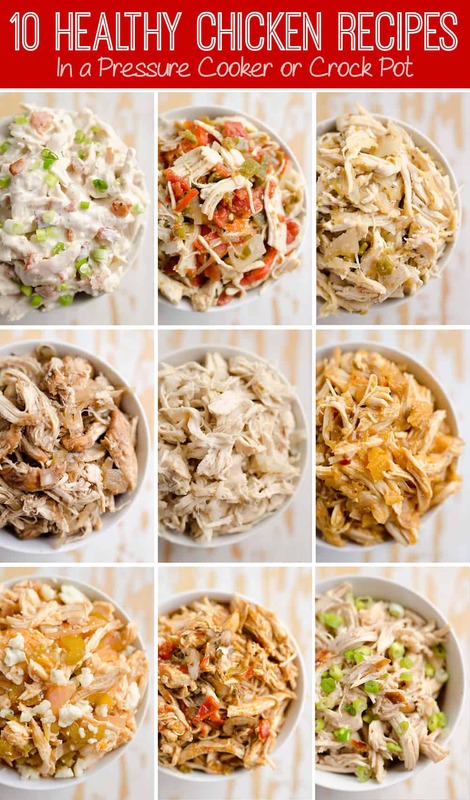 The best part about Airfryers is how crispy it cooks your food with little to no oil or fat. 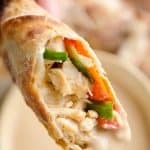 For these Airfryer Baked Thai Peanut Chicken Egg Rolls you can brush them with sesame oil or just give them a quick spray with non-stick cooking spray to crisp them up. For any pre-made breaded items, I don’t even bother with any oil at all! My coworker was so impressed with my Airfryer that I brought into the office that he bought one for himself at home. He did a side-by-side comparison of chicken tenders and homemade french fries in the Airfryer and oven. He reported back that the Airfryer cooked everything not only quicker, but crispier as well! If that doesn’t sound like a win-win, I don’t know what does. 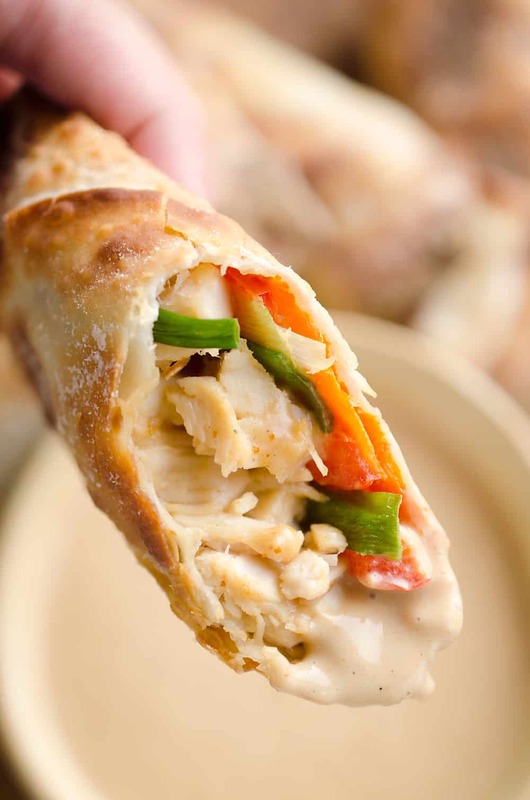 You can whip up these Airfryer Baked Thai Peanut Chicken Egg Rolls in less than 20 minutes. 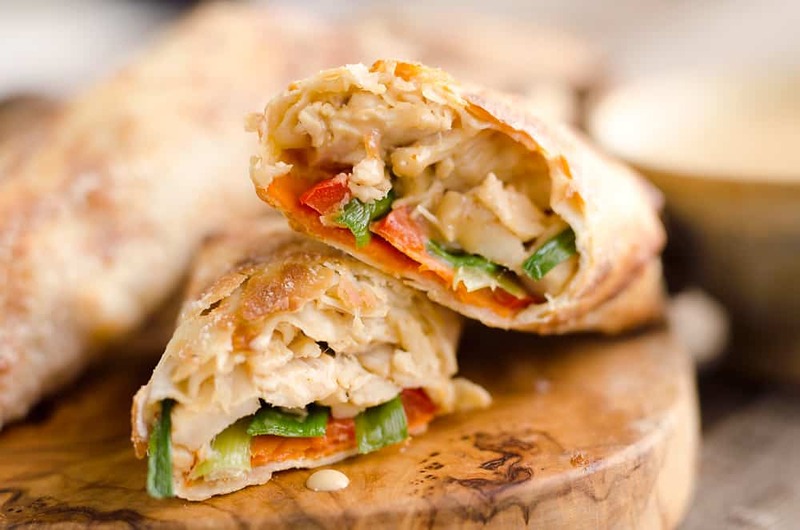 Layer the eggroll wrappers with thin slices of carrots, red peppers and green onions and top with the chicken tossed in the homemade Thai Peanut Sauce. Wrap them up using water to seal the edges and give them a few sprays of non-stick cooking spray. Pop them in your Airfryer and bake them at the highest temperature for 6-8 minutes. Another great benefit to the Airfryer is that you don’t have to feel bad about cooking up a small meal just for yourself. No more heating up the large oven and subsequently the entire kitchen for a quick meal. Let the magic of the hot air circulation in your Airfryer do the job much more efficiently! Preheat Airfryer to 390° or oven to 425°. In a small bowl, toss the chicken with the Thai peanut sauce. Lay the egg roll wrappers out on a clean dry surface. Over the bottom third of an egg roll wrapper, arrange 1/4 the carrot, bell pepper and onions. Spoon 1/2 cup of the chicken mixture over the vegetables. Moisten the outside edges of the wrapper with water. Fold the sides of the wrapper toward the center and roll tightly. Spray the assembled egg rolls with non-stick cooking spray. Turn them over and spray the back sides as well. Place the egg rolls in the Airfryer and bake at 390° for 6-8 minutes or until they are crispy and golden brown. 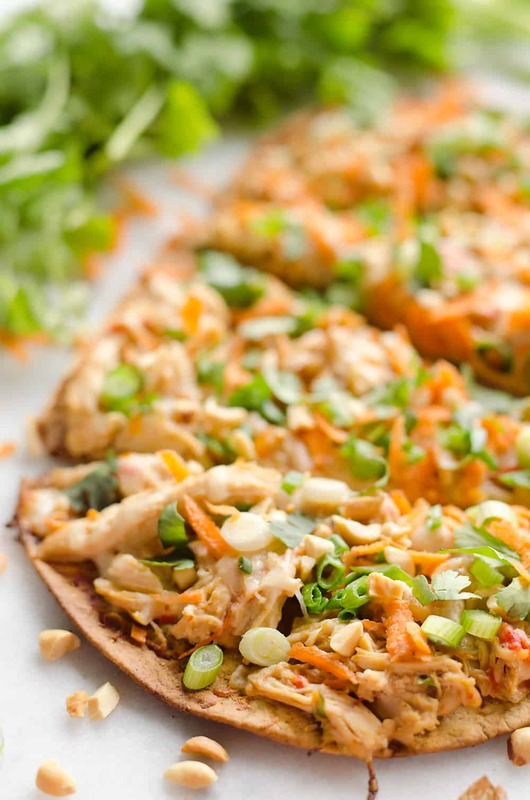 Slice in half and serve with additional Thai Peanut Sauce for dipping. 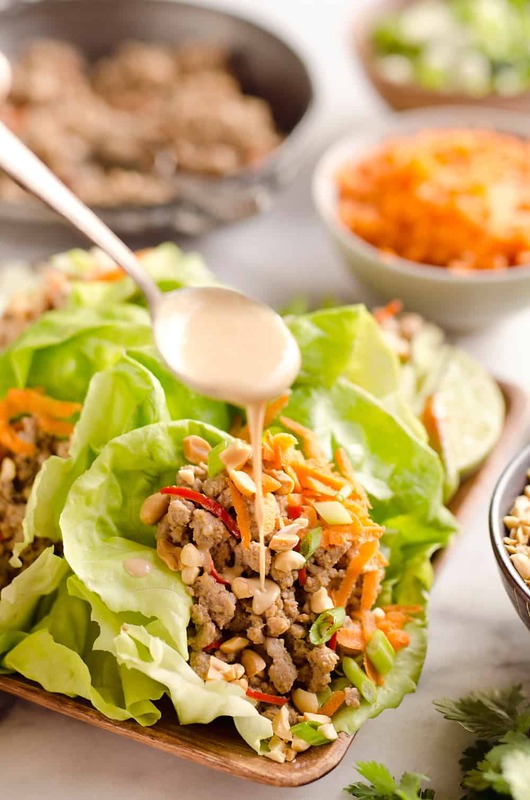 More great Thai Peanut recipes! Woops, yes! Thanks for pointing that out, I have corrected it. 🙂 Happy to hear your whole family loves them!